Thank you for your interest in Hidden Valley Wild Horse Protection Fund, an all volunteer Nevada non-profit organization headquartered in Reno, Nevada. Are you a company, corporation, foundation or individual interested in helping HVWHPF? This is what you can make happen with a grant of $1,000 to $10,000+ towards our program services. In addition, we have had incredible participation from our supporters with matching grants, as they've stepped up to help us double larger grants/donations. 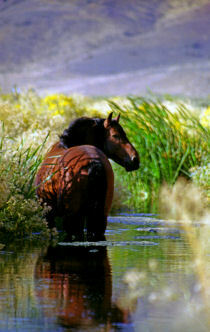 Hidden Valley Wild Horse Protection Fund is the largest horse rescue in the Reno, Nevada area. We are currently caring for and feeding 145 horses (geldings and mares). We are currently fortunate enough to have access to spring and early summer grazing pasture for the smaller of our two rescued horse herds. However, the larger herd feeding season is year round, and the smaller herd feeding season is fall through late spring. Of critical concern is how our donor’s funds are spent and ensuring we get the best possible use of those funds. We make every effort to maximize our buying power by purchasing large quantities of hay at one time. Purchasing directly from our local farmers is also an added benefit to our community. Buying in bulk and locally also helps to keep the cost of our hay delivery to a minimum. 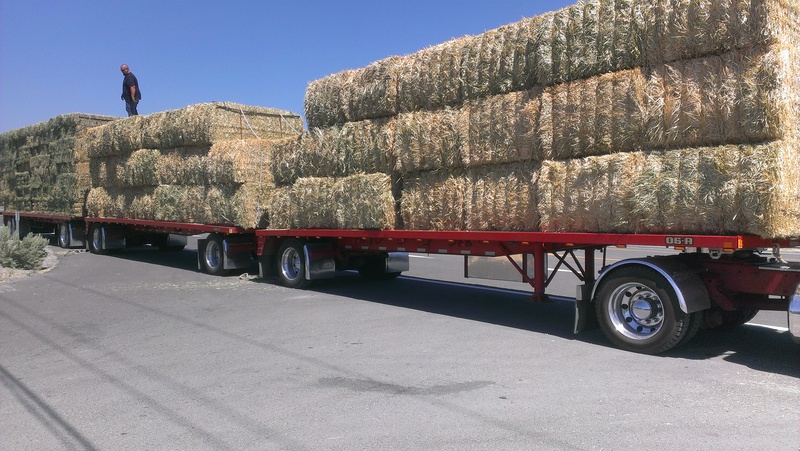 We also purchase "big bales" - large rectangular bales weighing 1,000 - 1,400 pounds whenever we can. This type of bulk buying significantly reduces the price of the hay. However times of wet or snowy weather, getting a truck and trailer into the soggy fields with that much weight isn't always possible, so during those times we must feed smaller "regular" size bales. After becoming a horse rescue unexpectedly in 2012, we have been boarding the rescued horses on private ranches north and south of Reno. We have dreamed of having them all on one property that would allow for training of our younger adoptable horses (and reduce our overal numbers through adoption), hosting our supporters at events, scheduled visits with the horses, and more. We are excited that those dreams have come true. Equine Legacy Ranch purchased over 650 acres of property north of Spanish Springs in 2017 that will become home to the Virginia Range Mustang Sanctuary! This will also be a place where some of our older horses will be able to live their lives in peace and safety. We also know that a certain number of at risk horses will be removed from the range each year. These horses would also benefit from such a wonderful transitional home while they are being gentled and trained for life with humans once we get our current numbers reduced through adoption. 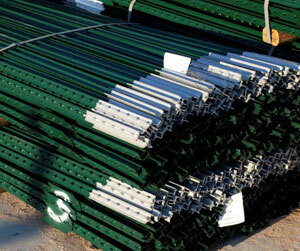 Fencing materials are a priority to ready the property for the horses. Every dollar that goes toward fencing materials brings us closer to that goal. To become a fully operational and responsible sanctuary, we are working towards much needed and vital pieces of equipment. - Large Hay Bale Squeeze Tractor - needed for moving big bales from storage, to the feeding stations in the fields. - Tilt Hydaulic Squeeze Chute - made specifically for horses (not cattle), this chute allows for humane vet and farrier treatment of unhandled horses, keeping both horse and human safe and secure. A must for properly caring for large numbers of unhandled horses. We are so excited that the long awaited Nevada Specialty License Plate, approved by the Nevada DMV is starting to move through the design process! The proceeds from this plate will provide funding for a variety of range projects to benefit the safety of the Virginia Range wild horses, as well as some funding of feed for the rescued Virginia Range wild horses in HVWHPF's care. With production approaching we need to launch a state-wide marketing campaign. We need to be able to reach many, many residents state-wide with information about the plate and what it will do for the horses! The level of marketing we need to do is not free, but is so very necessary for the horses and will benefit them for years to come. Tragedy & Triumph of the Virginia Range Wild Horses 2012-13 A summary of the activities that opened our Virginia Range wild horse rescue program in September 2012. We are so very grateful for the amazing support and encouragement of so many wonderful people who helped save these horses from slaughter. The Rescue of Cowboy, the cow pony Cowboy was rescued in April 2014. He was found cuddled up with a herd of cattle, separated somehow from his family. Now, he lives with the New Beginnings Herd, other rescued wild horse under the care of Hidden Valley Wild Horse Protection Fund. He looks forward to being gentled and trained! The Rescue of the 8 Steamboat Valley Bachelors 8 Bachelors from Steamboat Valley got themselves in trouble and had to be bailed out….our supporters rallied and in April 2014 we were able to spring them. They’re now in foster care where they will be gentled and trained. India, Roxie, Missy Cinco, & Frisco Rescued! 4 horses torn from their family, rescued by one of our alliance partners, and now part of the New Beginnings Herd.